Have Doncaster Knights finally laid their Cornish Pirates bogey? It certainly looks so after scuppering the Pirates for the fourth game in a row in their Green King IPA Championship clash at Castle Park. Fears that Pirates, whose record at Castle Park is arguably the best of any Championship club, would come out all guns blazing following their win over high-flying London Scottish last time out, failed to materialise and Knights were never seriously challenged as they recorded a bonus-point win. Knights showed five changes – several of them enforced due to injuries picked up in the narrow defeat at Headingley – but the performances of those who came in meant the likes of veteran forwards Matt Challinor and leading try-scorer Latu Makaafi, an unused replacement, were not missed. Challinor’s absence led to Knights’ boss Clive Griffiths selecting an all-Canadian second-row and both Tyler Hotson and Jon Phelan looked keen to prove a point against the likes of Bret Beukeboom who pipped them to a World Cup spot. Beukeboom, who was making his Pirates debut, was one of three Canadian World Cup stars making their first appearances of the season, though No 8 Aaron Carpenter lasted just 20 minutes. Sam Edgerley’s switch from wing to scrum-half served to give Knights more speed around the ruck area while long-serving Dougie Flockhart not only kicked well on his return to the starting line-up, but also stood out in open play. Although their lively backs carved out a couple of chances, the first half was mainly the story of Knights pack power. No 8 Ollie Stedman, yet to have a bad game this season, touched down from two catch-and-drive ploys which served to give his side a 14-6 interval lead which should have been more emphatic. Pirates rarely looked like scoring a try in the first half until flanker Alex Cheesman was denied in injury time by wing Tyson Lewis. Any comeback hopes Pirates may have entertained during the break were effectively shattered in the third quarter as Knights struck twice to open up a match-winning 28-6 lead. Centre Will Hurrell, who later had a try disallowed following a long spell of pressure, broke several tackles to score within two minutes of the restart. 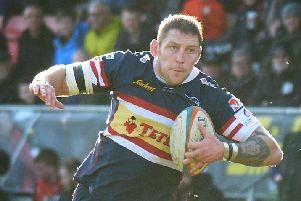 Skipper Michael Hills, who formed an effective back-row pairing with Alex Shaw, who was making his first start of the season, touched down after the speedy Lewis had been held just short following a midfield break. A replacement for Carpenter, Matt Graulich scored a well-worked 61st minute try for Pirates but that was as good as it got with centre Mat Clark nailing wing Matt Evans, the pick of the three Canucks, after he had got away down the left. Cornish Pirates: May (Bodilly 57), Arnott, Riley,James. Evans; Hallett, Day (Oulton 75); Walker (Jack 53), Elloway (Innard 53), Jamieson(Paver 63), McGlone (Atkinson 62), Beukeboom,Cheesman, Simmonds, Carpenter (Graulich 20).